On Thursday the price of gold reacted negatively after a US Federal Reserve policy meeting left the central bank's stance on raising interest rates intact, boosting the dollar. In late afternoon after-hours trade on the Comex division of the New York Mercantile Exchange gold for December delivery was changing hands for $1,218.20 an ounce, down $17.70 or 1.4% from yesterday's close and the lowest for 2014. After closing 2013 at $1,205 the price of gold jumped out of the starting gate, rising consistently to reach a high of $1,380 in March. But the subsequent retreat accelerated during the third quarter with a loss of 5% so far in September. Chairman Janet Yellen made no change to the Fed's guidance that interest rates would be kept low for a "considerable time" after the economic stimulus program in the form of quantitative easing winds down in October. The statement notes an unemployment rate that is "little changed" and inflation "running below [the] longer-run objective", suggesting Yellen is prioritizing policy support over the concerns of dissenting officials who worry that interest rates may need to rise earlier than previously flagged mid-2015. While the language was little changed, the Fed expects that short-term interest rates will be back to normal levels of around 3.75% by the end of 2017. Higher interest rates and bond yields raise the opportunity costs of holding gold because the metal is not income producing. 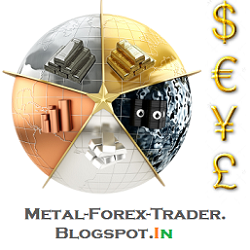 Higher rates also boost the value of the dollar which usually move in the opposite direction of the gold price. The dollar hit a six-year high against the yen on Wednesday while against a basket of the currencies of the US largest trading partners, the greenback surged to levels last seen early 2010. Even with the dramatic sell-off on precious metals markets last year and 2014's false start, an ounce of gold is still worth nearly 50% more than before the US central bank embarked on its stimulus program. 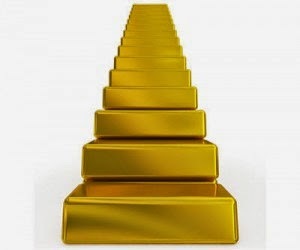 The first quantitative easing program which floods markets with easy money was announced by previous Fed chairman Ben Bernanke in December 2008 when an ounce of gold cost $837.50. The QE program together with other stimulus measures saw the balance sheet of the Fed cross the $4 trillion mark in January, up 400% in seven years. Gold's perceived status as a hedge against inflation is also burnished when central banks flood markets with easy money. With support from ultra-loose monetary policy in the US no longer providing support, other factors could work in gold's favour for the remainder of the year. Positives include the possibility of a sharp correction in US equities, better than expected buying in top consumer India ahead of the traditional gold-buying festival and wedding season, and a return of safe haven buying if the situation in Syria and Iraq deteriorates further and the ceasefire in Ukraine unravels completely.